I do. 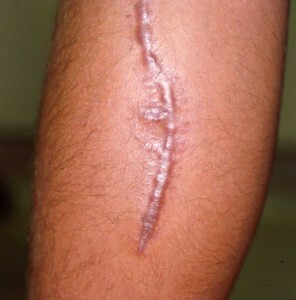 As a guy, I love telling the story of my scars- especially the ones I got on my arm from a motorcycle accident- laying the bike down, skidding down the street, the blood, having the gravel scoured with a brush- that kind of story. Scars always have stories. So when Paul says, “From now on, let no one cause me trouble, for I bear on my body the marks of Jesus”- it got me thinking about scars. Paul had plenty of them: beatings and whippings leave lasting marks, as do iron shackles and sharp stones thrown by an angry mob. His body told a hundred stories. But there were other scars, too- ones that couldn’t be seen but were just as real, had been just as painful. The hidden marks left by rejection, mistreatment, and humiliation. The lasting abrasions on the soul from the wounds of supposed friends, co-workers, even partners in the gospel. Being stabbed in the back can really scar your heart. But Paul isn’t whining about these scars, far from it. These physical and emotional wounds have become badges of honor- symbols of loyal service to a faithful friend and beloved King. The pain has been transformed into wisdom, the hurt has only made him stronger, wiser, and more focused. His battle scars are like a general’s stars- ranking his authority in God’s upside down kingdom. So what are your “for Jesus scars? I’ve got some of those, too. Some rejections, mistreatment, even betrayal. Not Paul’s level, for sure. But they’re real, as are yours. And they will either become the story of what we learned and how God grew us, or they’ll become the story of how life isn’t fair and we got a raw deal. One or the other. And I want mine to count. I want them to tell a story of growth and purpose and even joy. Not of whining and self-pity. How about you? What stories do your scars tell? What kind of seed are you? I know, weird question. Let me explain. I was reading in Isaiah 28 about how different kinds of seeds are threshed. One kind is beaten with a light stick, another with a flail (a stick with a bar on it), while another kind is rolled over by a wheel that’s got some weight, but not so heavy that it will crush it. Different seeds require different approaches. Now think about our lives- the different ways that God gets our attention. Sometimes a gentle whisper will suffice. Other times He needs to turn up the volume- to allow “heavier” things to come our way. Sometimes, when we seem to have deaf ears and harder hearts, God allows the wheel to roll over our lives. Not to destroy us, but to get our attention, to draw us back to Him. His purpose is not to bring us harm but to cause us to grow, to open our hearts to who He is. I heard a quote from Alan Redpath that has stayed with me, “When God wants to do an impossible task, He takes an impossible person… and crushes them.” Wow. From brokenness flows humility, and God can work with that. Sometimes God uses a light touch. But sometimes, apparently, He has to bring the heavy equipment. 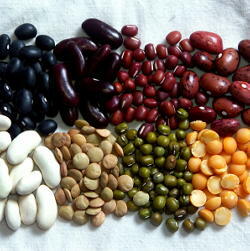 So which kind of seed is your heart like these days? Can God get your attention with a whisper or a nudge? Or is something heavier required? May our hearts be soft and our ears be tuned in for the call of the One who loves us- Jesus. ONE OF THE BEST WAYS to begin practicing solitude is to notice times when silence occurs naturally in our day. Even those of us who are incredibly busy have moments when we are alone, when nothing is happening. Usually we ignore these moments or find ways to fill them. Instead, we can appreciate these times and savor them. We can use these times to turn inward and attend to our feelings. Time in the car offers an excellent example of a potential period of silence. Although we need to attend to our driving, this is a time when we can actually be both alone and quiet. Usually we fill this time with listening to music or talking on the phone. Next time you drive, try something different. Don’t turn on any gadgets. Tell God that you intend to use this time to pray, to just be quiet. Then see what happens. Watch the thoughts and feelings that arise. Notice your own distractions. What is the state of your mind, your heart? Are you at peace? Are you angry, sad, confused? Have you thought about God yet that day? When you arrive at your destination, thank God for the time together, whatever has happened. Don’t berate yourself if you haven’t had a “good” experience. You can try again. Great story about hope and perseverance- and the AZ Cardinals! I’ll begin with the story of Jason and Mandy Taylor. Not that Jason Taylor. This one’s a 33-year-old Cardinals fan who I met on the sidelines of the Packers-Saints game at Lambeau Field last week. 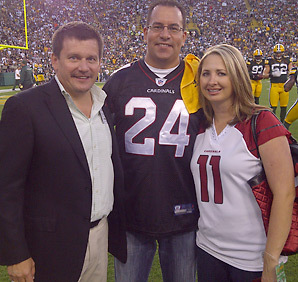 Cardinals president Michael Bidwill introduced Taylor and his wife, Mandy, to me. They were there to take the Cardinals flag hoisted on the field that day back to the Cards’ home opener Sunday. “You should talk to Jason,” Bidwill said to me. “He is one inspirational story.” I met the Taylors and then spoke to them by phone on Saturday. Just after midnight on the morning of March 26, Taylor, a speaker and recruiter for a Phoenix college, walked out of a bar in Glendale, not far from the Cardinals stadium, to hail a cab, leaving Mandy inside. Outside, he met two men smoking cigarettes, and he made small talk with them. They were talking about serving in the military. “I always wanted to do that,” Jason said, but life took him on another path. If he ever did serve, he said, he’d have wanted to be a Marine, because he so admired their ideals. At that moment, one of the men pulled out a pistol and shot Jason Taylor in the head. Taylor had been standing with the men for 30 seconds, max. The other man in the trio said Taylor’s comment was completely innocent. That’s all he said. For that he was shot in the skull. The shooter, Jeremiah Pulaski, a 24-year-old Arizona man recently back from Army duty in Afghanistan and Iraq, fled on his motorcycle. Police eventually located Pulaski on his bike, and he died in a firefight with a police officer, who was not hit. Pulaski’s parents told police they believe he was suffering from war-related stress. For days Jason lay in a coma. They didn’t know when he’d awaken. Finally, about 13 days later, he woke up. A nurse gave him a greaseboard and pen to write, so he could communicate, because he couldn’t speak. Mandy told him the whole story. She told him how long he’d been out, and what the doctors did. Then he asked for board again. The Cardinals put players, Larry Fitzgerald and others, in touch with the Taylors. Long-snapper Mike Leach and his wife hosted the Taylors at training camp in Flagstaff this summer. And Bidwill invited them to the NFL’s kickoff game in Green Bay. When I met Taylor, he was smiling like a 7-year-old on Christmas morning. Then he brought the flag on the field Sunday, before the opener with Carolina. The team he loved so much loved him back. Jason Taylor is rehabbing these days, hoping to get in mental and physical shape well enough to resume his recruiting life for Brown Mackie College. “I’m about 70 percent right now,” he said, “and I hope to get back to 100 percent. I’ve got some memory issues, and balance issues — big time. It’ll take a while, but I’m determined. It’s hard. I read where 92 percent of all people who get shot in the head do not survive.” He played poker Saturday night for the first time since the shooting; that’s his big leisure activity. That, and the Cardinals. What makes his story compelling to me comes next. I just thought you would be helped by that today. I know I have been. 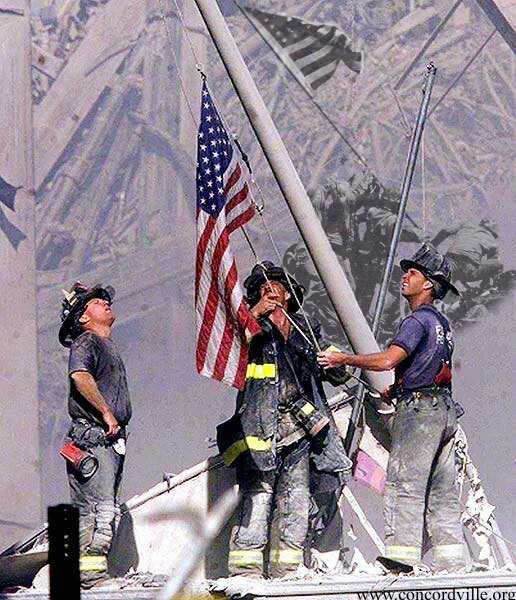 Having just come through the remembrances of the ten year anniversary of the events of 9-11, I found myself thinking about our world. Ten years later, are we- and not just Americans- better off? Are we safer or more secure? Have we learned lessons that make life better for all people? In truth, it doesn’t feel like we really have. Yes, we have taken many steps to increase security precautions, fought 2 wars, and perhaps live with a greater awareness that the world doesn’t begin and end on our own continent. But does anyone really feel that the world is actually pursuing peace over self-advancement and preservation? Mutual cooperation over mutual mistrust? The good of the least of these over the greed of the most of these? Neither do I. He is the One we long for. His Kingdom- may it come in fulness. May it come soon. Come, Lord Jesus! Great story! Do you remember Heather Mercer? Came across this story today- seems really fitting in light of all the coverage of 9-11.